Full cream evaporated milk. Minimum 9% Milk Fat, 22% Milk Solids Not Fat. Good to remember: Great served with fruit to help towards your 5 a day, or with your favourite puddings. Good to know: Made using fresh milk, making it a source of calcium. It is a good source of vitamin D.
Have you tried... 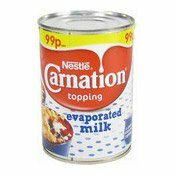 Topping your warm crumble with creamy Carnation Evaporated Milk? Delicious! Not for infants under 12 months. Once opened, refrigerate in a suitable sealed container and use within 3 days. Simply enter your details below and we will send you an e-mail when “Evaporated Milk (三花淡奶)” is back in stock!